See all award details under News. Peter Sharp was awarded life membership after his tireless efforts at the club. Hayden Gleeson and Darren Howard who played 300 senior games each were also awarded Life Memberships. Full awards list under 'News' tab. Senior Grade, Under 14's football teams and Under 12 Netball team won the Grand Final for 2017. See article under 'News'. Jamie Parr wins Azzi Medal for Senior Grade League Best & Fairest, club Best and Fairest plus Des Kennedy Memorial Award for Best on Ground in the Grand Final, well done Parr dog. Michael Gleeson wins Odewahn Medal for Reserve Grade League Best & Fairest plus club Best & Fairest, well done MJ. An immaculate ground has been achieved by many hard working volunteers, congratulations to all involved. Marty Bahr played his 150th first grade game, Toby Hill played his 100th Reserve Grade game. Congratulations. Reunion Day for 3 premierships. Fantastic fun was had at the Masquerade Ball and Grandparents enjoyed afternoon tea with the Auskickers. Osborne legend Stephen played his 200th 1st Grade Game, congratulations. Jamie Parr played his 153rd 1st Grade. Jeremy Bahr played his 100th 1st Grade. George Alexander played his 50th 1st Grade game. Congratulations to all. Due to an under 17's no game, a fantastic game was organized and played by Under 17's and old blokes from the club, may become an annual event. Check out 'News' tab for more information. Fantastic evening was enjoyed by all at OFC Headquarters, the decorations were stunning as well as the bridal party and guests. Milestone games this week for Hayden Gleeson 300 games, Marty Bahr 150 games. Osborne favourite Adam Schneider returned after 15 years to play on his home ground, what a fantastic day this was. The boys received their jumpers from Adam Schneider. Garry O'Connell OAM was inducted into the Hume League Hall of Fame, he served 25 years as OFC President, HFL President for 17 years, life member of the league, OFC and AFL NSW/ACT. A cheque for $4000 was presented to Osborne as a grant, thank you Brad Davis and Dow Agroscience. Michelle Gleeson's submission was chosen out of 200, well done Michelle. John Jacobsen Memorial Cup New goal posts. Heaps of pics this week including some netball and pics around the ground, thanks to Maryanne & Deb. A very wet day, thanks to Helen Schmetzer and Graham Bahr for photos. 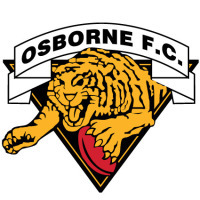 The Osborne Football Club Scholarship is a new scholarship to the Charles Sturt University Foundation. Established by the Osborne Football Club which boasts a rich history of AFL in the region, the club wish to provide support to a student studying on either the Wagga Wagga or Albury-Wodonga Campus’ who has an interest in and commitment to AFL. Congratulations Max. Craig Bolton (Deputy General Manager), Paul Habel (Community Football Program Manager), Joseph La Posta (Planning-operations) from AFL NSW/ACT visit Osborne Football Club Grounds to check out the facilities. 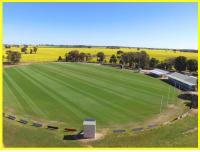 1st home game for 2013 with stage 2 of pavilion completed and raising of 2012 Premiership Flags. Fantastic new netball shed, thanks to major sponsors Proway and Metroll and all the man hours of voluntary labour. On 16th September, 2011 a dinner was held at Osborne where the Team of the last decade was announced. The ground has never looked better. Check out the new Time Keeper's Box, Score Keeper's Box, BBQ area and First Aid Room. The oval is green and lush, there have been a lot of busy beavers over the break! Thank you to all who have contributed in any way.